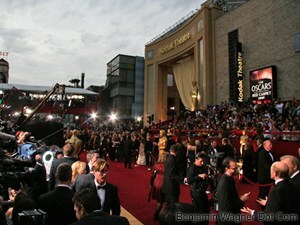 Live From 2009 Oscar Red Carpet! 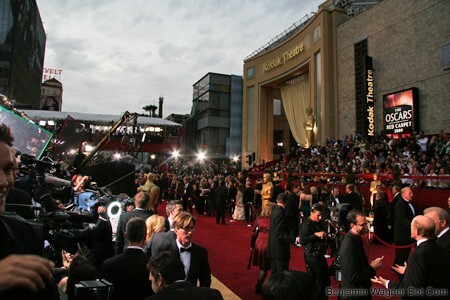 There was something oddly normal about standing there in the shadow of The Kodak Theater tonight as Hollywood’s most-celebrated walked Oscar red carpet. Maybe it was the light; the typically sun-dappled, Technicolor California sky was choked with clouds. Maybe it was that I’ve done a few of these before (see also Grammys, VMAs, etc). Or maybe it was optical fatigue; I mean, we’ve all seen a few million red carpets on E!, right? 12:46PT- The Oscars don’t begin for just shy of four hours, and yet I’m a) en route (shuttle bus to Hollywood & Highland from Sunset & Vine; Cindy Adams is on our bus, by the way) and b) exhausted; I haven’t quite adjusted to the time zone despite being here since Wednesday. 1:00PT- I’m standing on Tom Selleck’s star on Hollywood Boulevard waiting to pass through security. Helicopters are buzzing overhead. It feels like we’re going to battle… in tuxedos. 1:14PT- We’ve assumed our positions, a four-foot wide, six-foot deep, two-level riser roughly half-way down the red carpet. There are far too many men wearing far too much makeup. (One fella’ in front of me is wearing a white bow tie turned orange). At this point, the audience is in place and cheering on cue, but the celeb quotient is zero. Press outlets are interviewing each other. 1:56PT- Al Roker just waddled by. 2:04PT- First celebrity on the red carpet? America’s Best Dance Crew host (and former Save By The Bell star) Mario Lopez. 2:07PT- Lisa Renna? Lovely woman I’m sure. But lookin’ a little tired under the eyes, brittle in the hair and puffy in the lips. Not to be mean, but just a little scary. 2:26PT – Wow, Mickey Rooney. He’s walking slowly, holding onto a the woman in front of him, looking up and grinning. What must he think of how radically all of this has changed since, say “Mickey’s Busy Day”? 2:43PT- Wolfgang Puck and Tim Gunn narrowly avoid red carpet run-in. Phew. That Oscar cake of his would have been all over the place. 2:46PT- Price Waterhouse briefcase guys walk the carpet to prompted applause. 3:00PT- Miley Cyrus is here: It’s on like… a silly love song! 3:14PT- Phoebe Cates (mis-identified by the announcer as Selma Heyek) walks by prompting “Fast Times” flashbacks. 3:44PT- Here’s who’s in eyeshot right now: Anthony Hopkins, Louis Gossett Jr., Danny Glover, Man on Wire Philippe Petit and Zack Efron. Such odd juxtapositions. 4:06PT- Gus Van Zandt looks like he got his jacket at The Gap. Great tie, though. 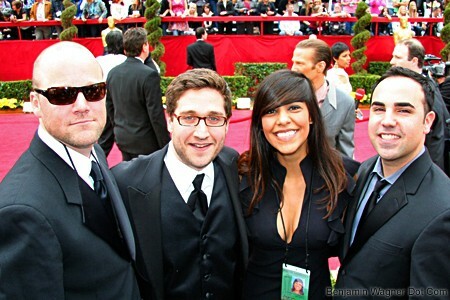 4:10PT- josh just asked the “Slumdog Millionaire” kids how manu Oscars they have between them. I’m not sure they understood it was a joke, but are adorable and hilariously, excellently enthusiastic. 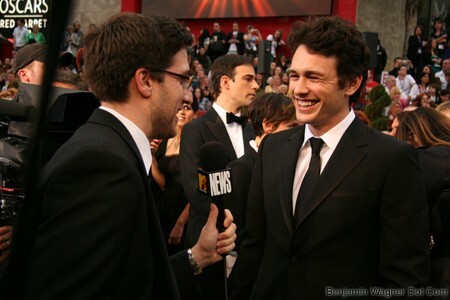 4:14PT- James Franco hip-hop just hugged a random publicist. 4:15PT- “Everybody,” the announcers says over the din of helicopters, “Robert Pattison!! !” Shreiks drown EVERYTHING out. 4:19PT- Within eyeshot: Anne Hathaway (with whom Josh is speaking), Heidi Klum and Seal talking with Dev Patel, Matthew Broderick & Sarah Jessica Parker, Danny Boyle, Richard Jenkins, Penelope Cruz and Fred Willard. 4:45PT- The brain-numbing cognitive dissonance continues as Kate Winslet (hubba hubba), Sofia Lauren, Frank Langella, Peter Gabriel and Robert Downey pass by. Josh valiently hollars, “Robert! Robert! Robert!” To no avail. 4:46PT- Brad and Angelina float by, pausing only long enough to greet “Slumdog” co-star Madhur Mittal. 4:55PT- Josh interviews Ron Howard and David Frost. 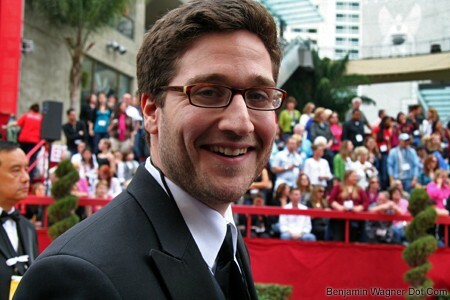 Christofers’ first job was editing his US interview specials at Classic Video in Cleveland. Now here we are. 4:56PT- Penelope Cruz blows off Josh. Sigh. I think we’re done here. I’m back in my room at The Chamberlain now. My tux is strewn across the bed. The screen door is thrown wide. The day is done. Just a few hours later, though, it already seems like a dream, like something I watched on television. I know I was there; I’ve seen the pictures. So I’m not sure why it seems so fantastical or out-of-body. I’m not sure what that’s all about. I have a bag to pack, a rental car to return, a plane to catch, and a wife to embrace, though. So if you’ll excuse me, I have my own movie to make: The Story of My Life.